The heroes of Lion Forge’s Cellies. The single-minded determination of a person hellbent on avenging their murdered family members is strangely similar to the passion displayed by very committed tech enthusiasts who line up for launch day events. Though the subject matter of this week’s comics couldn’t be more different, one thing they have in common is that their characters all have unshakable resolve—resolve that’ll feel all too relatable, even if you’ve never personally sought deadly revenge or slept outside an Apple store waiting for the newest iPhone. Dag lamenting that his daughter Elsbeth has killed a man. There’s a dry, desolate kind of sadness that’s difficult to describe in Dark Horse Comics’ Sword Daughter, written by Brian Wood with illustrations from Mack Chater and José Villarrubia. The comic tells the story of Elsbeth Dagsdóttir, a young, mostly silent Viking girl who was raised by angry nuns after most of her village was burned to the ground by marauders. The only other person to survive the attack, Elsbeth’s father, slipped into a decade-long coma after the attack, effectively leaving the girl to fend for herself for all those years, an experience that leaves her more hardened and cold than any child ever should be. Elsbeth’s life takes a sharp turn when her father suddenly awakens, because she’s unsure of how to feel about him, a man who only knew her as an infant before she was able to develop any emotional attachment to him. Like her father, Elsbeth longs to avenge the murder of her family, but at the same time, she can’t help but feel a great amount of animosity toward her last living relative because she deeply feels that he abandoned her. Though Elsbeth’s a girl of few words, Mack Chater and José Villarrubia’s artwork brings the girl’s emotions to life with a bold, though limited color palette, and striking detail that deftly conveys the anger and sadness coursing through her. Sword Daughter is a quiet and contemplative book that will leave Elsbeth’s thoughts lingering with you long after you’ve finished reading. Jog Mobile employees trying to keep bloodthirsty customers at bay as they wait in line for new phones. There are few forms of torture more traumatic than being made to work a retail job on the night of a major product launch. If everything doesn’t go exactly right, hapless employees have to deal with furious people demanding to speak with their managers while insisting that the customer is always right—and because of the capitalist culture we live in, there isn’t really all that much the workers can do. This is the unenviable position the heroes of Lion Forge’s Cellies—written by Dave Scheidt with art by Joe Flood—find themselves in as the series opens. Just as Jog Mobile’s newest phone is about to launch at midnight, the employees at a local store receive word that there’s some kind of problem with the phones that poses a significant threat to users. Corporate policy says that the employees only need to put big warning stickers on the boxes, but as they do, the phones within begin to secrete a glowing ooze. 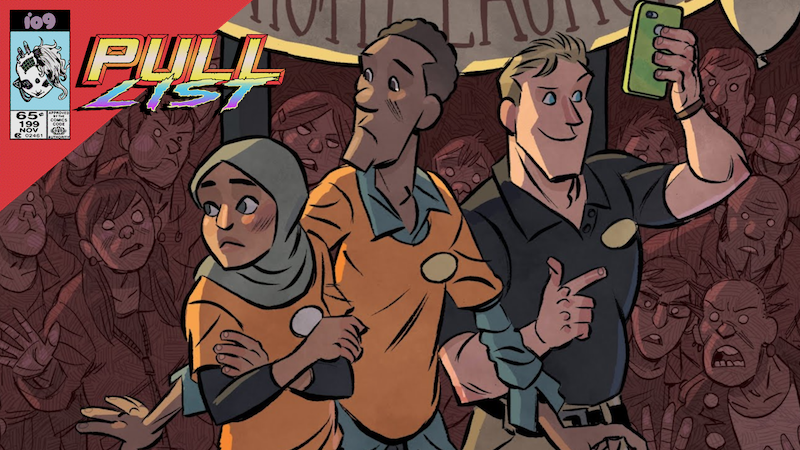 Cellies has all the makings of a classic zombie story: radiative goo, a mindless mob, and a group of hapless soon-to-be victims trapped in an impractical building that probably won’t keep them safe. To be clear, Cellies is a straight-up critique of the ways that we’ve all become addicted to our cell phones, but unlike many other pieces of art attempting to tell us to unplug, the comic’s not at all preachy and it definitely understands that this is just the world we live in now. Really, though, can you think of a worse place to be during the beginning of the zombie apocalypse than in a phone store that’s made mostly of glass?